For pitched roofs, the company launches EcoX Universal Rail-Less Racking fits any module thickness from 32mm to 46mm using a single size for each core component. The system's Universal fit enables installers to stop stocking multiple racking SKUs, streamlines shipping and storing, and minimizes jobsite interruptions. As a rail-less application, 33 percent fewer attachments are required and awkward rails are eliminated, enabling installers to install faster and increase job completion rate from one job a day to two. 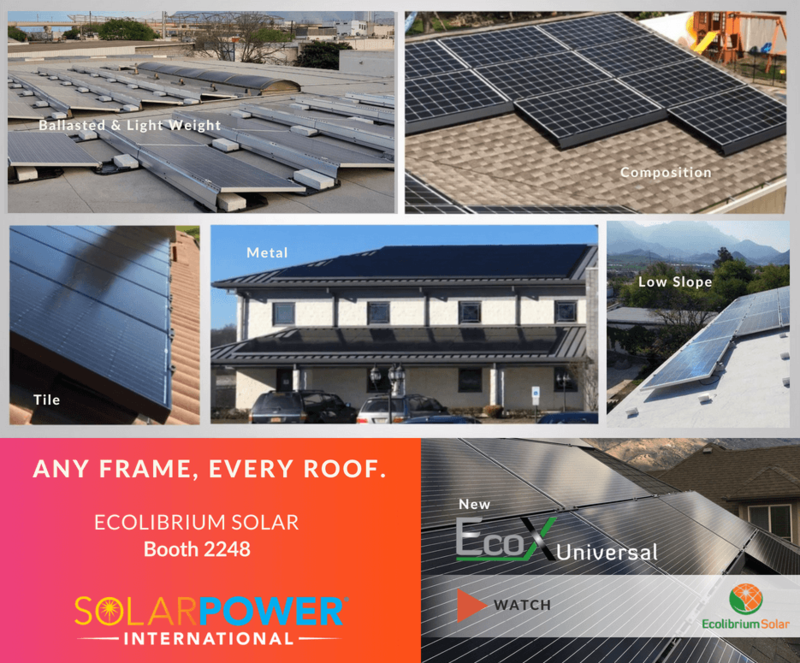 Ecolibrium also introduces new Metal X for fast, simple installation on metal roofs. The new XClamp works with popular attachments for corrugated, standing seam and R-panel attachments. Components are simple to install, ship and store, making installing on metal roofs economical, with costs and labor savings leveraged across large arrays. Installers can increase spans and reduce attachments by substituting Couplings for select XClamps. By using fewer attachments, costs and labor are firther reduced. For the popular EcoFoot2+ and EcoFoot5D High Density Ballasted Racking, the company introduces expanded applications. Installation on lighter weight roofs is enabled through optimized array design and the new option for Smart Attachments. New Smart Attachments optimize the placement of attachments within the EcoFoot Racking System, getting the maximum uplift resistance out of each attachment. Smart Attachments take installation flexibilty to a whole new level, enabling either fully ballasted, fully attached, or hybrid systems that combine ballasts and attachments.